Roy Cleveland Sullivan is recognized by Guinness World Records as the person struck by lightning more recorded times than any other human being. 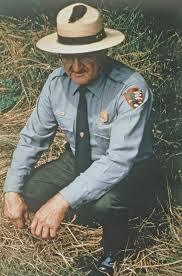 Sullivan (February 7, 1912 – September 28, 1983) was a U.S. park ranger in Shenandoah National Park in Virginia. Sullivan was hit by lightning on seven different occasions and survived all of them between 1942 and 1977. For this reason, he gained a nickname “Human Lightning Conductor” or “Human Lightning Rod”. He died from a self-inflicted gunshot wound at the age of 71 over an unrequited love. 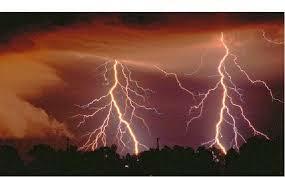 The first documented lightning strike of Sullivan occurred in April 1942. He was hiding from a thunderstorm in a fire lookout tower. The tower was newly built and had no lightning rod at the time, it was hit seven or eight times. Inside the tower, “fire was jumping all over the place”. Sullivan ran out and just a few feet away received what he considered to be his worst lightning strike. It burned a half-inch strip all along his right leg, hit his toe, and left a hole in his shoe. He was hit again in July 1969. Unusually, he was hit while in his truck, driving on a mountain road – the metal body of a vehicle normally protects people in cases such as this by acting as a Faraday cage. The lightning first hit nearby trees and was deflected into the open window of the truck. The strike knocked Sullivan unconscious and burned off his eyebrows, eyelashes, and most of his hair. The uncontrolled truck kept moving until it stopped near a cliff edge. In 1970, Sullivan was struck while in his front yard. The lightning hit a nearby power transformer and from there jumped to his left shoulder, searing it. In 1972, Sullivan was working inside a ranger station in Shenandoah National Park when another strike occurred. It set his hair on fire, he tried to smother the flames with his jacket. He then rushed to the restroom, but couldn’t fit under the water tap and so used a wet towel instead. Although he never was a fearful man, after the fourth strike he began to believe that some force was trying to destroy him and he acquired a fear of death. For months, whenever he was caught in a storm while driving his truck, he would pull over and lie down on the front seat until the storm passed. He also began to carry a can of water with him and believed that he would somehow attract lightning even if he stood in a crowd of people. On August 7, 1973, while he was out on patrol in the park, Sullivan saw a storm cloud forming and drove away quickly. But the cloud, he said later, seemed to be following him. When he finally thought he had outrun it, he decided it was safe to leave his truck. Soon after, he was struck by a lightning bolt. Sullivan stated that he actually saw the bolt that hit him. The lightning set his hair on fire, moved down his left arm and left leg and knocked off his shoe. It then crossed over to his right leg just below the knee. Still conscious, Sullivan crawled to his truck and poured the can of water, which he always kept there, over his head. The next strike, on June 5, 1976, injured his ankle. It was reported that he saw a cloud, thought that it was following him, tried to run away, but was struck anyway. On Saturday morning, June 25, 1977, Sullivan was struck while fishing in a freshwater pool. The lightning hit the top of his head, singed his hair, traveled down, and burnt his chest and stomach. Sullivan turned to his car when something unexpected occurred – a bear approached the pond and tried to steal trout from his fishing line. Sullivan had the strength and courage to strike the bear with a tree branch. He claimed that this was the twenty-second time he hit a bear with a stick in his lifetime. All seven strikes were documented by the superintendent of Shenandoah National Park, R. Taylor Hoskins, and were verified by doctors. Sullivan himself recalled that the first time he was struck by lightning was not in 1942 but much earlier. When he was a child, he was helping his father to cut wheat in a field, when a thunderbolt struck the blade of his scythe without injuring him. But because he could not prove the fact later, he never claimed it. Sullivan’s wife was also struck once, when a storm suddenly arrived as she was out hanging clothes in their back yard. Her husband was helping her at the time, but escaped unharmed. Previous: illusion – is it a Frog or a Horse?